Reluctantly, on Sunday morning we left Fernie to head back north and east to Lake Louise/Banff. Although it was out of the way, I had heard such wonderful things about the area and I felt that my cross country adventure would be missing something important if it was bypassed. We stopped in the ski destination of Invermere, B.C. for groceries and some lunch on the way up, treating ourselves to a sit down meal before heading into a few days of eating on a camp stove in the wilderness. As we drove down the main street, we saw signs for Ray Ray’s Beach Pub, which claimed to have the best view in town. Easily convinced, we drove through the few blocks of the main strip and sat down looking out onto the mountains, a pond with a fountain, and the crisscrossing lines of the railroad track and electric poles. It was an artful view, but perhaps if we had been sitting outside (it had started to rain and was cooler now) we would have seen impressive Windermere Lake. The food was typical Canadian pub food: I devoured a sweet Thai chicken wrap with yam fries and salad, while Nick dined on a beef sandwich. Lake Louise, Alberta is a tiny village with one main plaza (Samson Mall), which includes a few restaurants, a grocery store, gift shops, and a visitor centre. We spoke to a very helpful woman in the welcome centre, who gave us detailed information on hiking in the area, and where we could find the best vistas for taking photographs. We paid $6 for four litres of water (a forgotten item on our grocery trip in Invermere), and decided not to spend hundreds of dollars on warmer gear in Wilson Mountain Sports. My advice is to do your research on the weather (we were seriously underprepared for the cold mountain air), and make your grocery list and check it twice! Our first evening was rainy and somewhat miserable. We shivered in weather that went down to 2 degrees Celsius, dreaming of toques, mitts, rain pants, long underwear – all things that were nicely packed away in a container on its way to Vancouver. In a few moments of weakness we considered going home; we were exhausted after the move and the drive and were just too darn cold. However, we steeled ourselves and got geared up for a hike around Lake Louise on Monday morning. 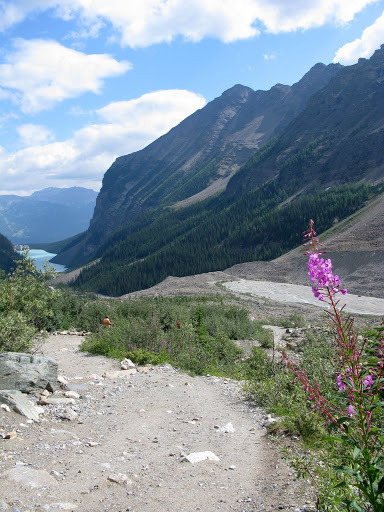 Although you are able to see beautiful views of the lake and mountains from just making your way around the lake, we wanted to do a proper hike to the ‘top’ of Plain of Six Glaciers, which had been recommended to us. The lake water is a turquoise blue and is an absolute complement to the dark, snow-capped mountains that form a curve at its tail end (from the Fairmont Chateau Lake Louise). Hiking along the shore is light and easy: you can take your time, stop to take photos, say hello to fellow travellers. One of my favourite things about hiking around the world is the number of different languages you hear along the way: Japanese, Chinese, French, Italian, Dutch, German and British tourists walked with us, ahead of us, around us. You feel a sense of global community by sharing in this experience with such a diverse population. As you move beyond the lake, the trail starts to move upwards and becomes a little tighter; moving into the higher latitudes it is harder to breathe as the air gets thinner. It is a good idea to wear layers for the hike, as you start to warm up with the exercise of getting to the top. However, once you get there and settle in for a few minutes, you will want to layer up against the mountain chill in the air. At the top, there is a tea house that was built in the 1920s by Swiss guides and still hosts a variety of food and drink today. They helicopter the raw goods and propane (there is no electricity) once a season, while the fresh goods come in on horseback or with the staff almost daily. Make certain you have some cash with you, as a nice, hot tea is a great treat after your 5.5 km hike! We ate our own packed lunch on the upper level of the tea house, enjoying a great view as we took a break from our efforts. Afterwards, we treated ourselves to the hot springs in Banff. Not a huge space, it still has an impressive view of the mountains, and was a warm 39 degrees. Before heading downtown, we stopped at the Indian Trading Post, where we found toques for $5 (what a deal!) and some Manitobah Mukluks (slippers) to warm my feet on cold winter (or summer in this case) nights. We walked around Banff town, enjoying a coffee from one of the three Evelyn’s Coffee shops along the main street. There is a relatively good variety of stores and restaurants; overall, Banff is an inviting place that I would like to spend more time in. Our evening was filled with attending to the campfire, drinking Fernie pale ale, and singing Sam Roberts. I’ve never felt so Canadian. It was an ideal end to a cross country trip filled with diverse history, landscapes and people. I love this country. Day Five: Beautiful Fernie, B.C. Fernie is a little known town, but is definitely worth a visit. It has a delightful main street with over one hundred years of history, and includes most of the amenities we are accustomed to in the big city. However, the wonderful thing about Fernie is the 360 degrees of pure mountain beauty meeting you at every corner. It includes a few restaurants, both casual and upscale; we grabbed a quick bite at Big Bang Bagel, one of the many shops on the main strip with a clever name, and found much needed energy for our day hike in the signature breakfast bagel. The town also has some great specialty stores, such as Womb to Grow, a maternity shop run by a doula (a woman trained to help during pregnancy, birth, and after the baby is born). Our big adventure for the day was a 3 hour hike (return) to Castle Rocks. After twisting around a gravel road for several minutes, we parked on a side road and embarked from there. It is not that well marked for visitors from out of town, but fortunately we had a guide, a good friend from Ontario who purchased a condo there last year. We followed three trails to get to the top: Roots, Hyperventilation, and Castle Rocks. Roots was mostly flat, wide and easy going as a trail, but it started to get steeper and was one-track after that. In difficulty it was a “Blue” which turned into a “Black Diamond”, the same rating they use for ski trails. For much of the hike we were in the woods, but when we approached Castle Rock itself, a dark orange and grey entity that rises starkly against the blue sky, the trail opened up. The views were magnificent panoramas of mountains with grey tops and green slopes, which lead down into the valley where the town resides. You can see Fernie Alpine Ski Resort, while The Three Sisters rock formation stands out above the rest of the mountains, majestic. Mountain bikers are known to walk their bikes up the mountain and then bike back down. It seems like a magnificent thing, but much too extreme for my liking! Overall, Fernie is a wonderful place for those who love the outdoors; it is a haven for people who like to hike, bike, camp or swim, and is full of friendly people. We were off to an early start again, but this time we enjoyed the complimentary breakfast at The Holiday Inn Express before hitting the road for Moosejaw, which is less than an hour from Regina. Moosejaw downtown, although small, holds much history and is charming in its own right. It has connections to Al Capone in the 1920s, the time of prohibition and high crime, and the city also has links to Chinese immigration of the early 20th century; men who were hired to do the dangerous task of building the railroad for the CPR; families seeking refuge from a time of political turmoil in the Far East. The Tunnels of Moosejaw tour covers the history of the town, and although we did not have time to take a tour, we did hear great things about it and at least got to enjoy the black and white photo museum depicting the early days of the town. 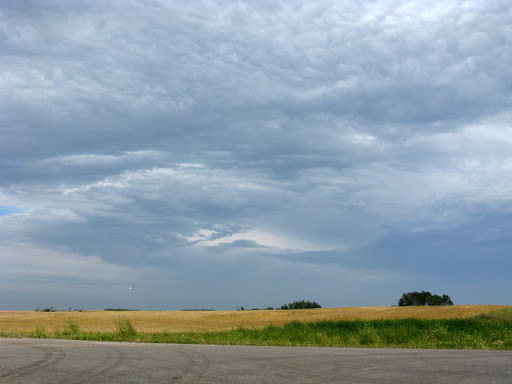 The drive was monotonous prairie for a long time, but when we approached the Alberta/B.C. border the view started to shift from wide plains topped with sky to rolling fields framed by the Kootenay mountains. I was somewhat overwhelmed by all of the new things to see: valleys, rivers, windmills upon windmills. Even the hay bales seemed artistically arranged by this point. We were heading into Crowsnest Pass, a well known area to west coast dwellers, and a beautiful drive most cross country travellers miss because they usually pass through Calgary. However, we were headed south to Fernie, B.C., approximately 30 minutes from the Alberta border. 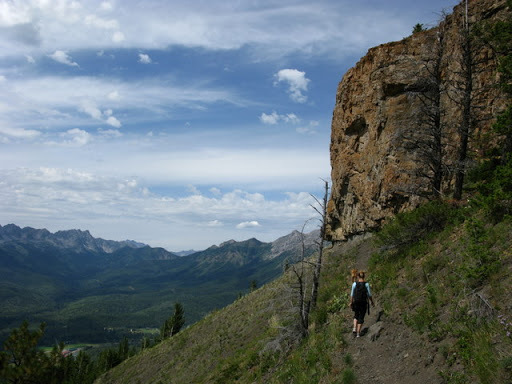 Crowsnest Pass features winding roads and mountains both green with trees and grey with impressive rock. We paused for a snack at Leitch Collieries in the pass, and learned that the NWMP were stationed there over one hundred years ago to patrol people illegally hiding cattle there on the way to the U.S. It also served as a coal mine, one of the most important resources in the area. Once we entered B.C., very inconspicuously as the provincial border is not well marked, we paused for a pit stop in Sparwood to witness the World’s Largest Truck. Its tires doubled my height, and oddly enough, it looked like it was even road ready. One thing to note for travellers heading west – most provinces provide free road maps, which vary in specificity, however in British Columbia you have to pay for one! After our pit stop in Winnipeg, we embarked on our prairie adventure. Remarkably, for the first few hundred kilometres of the prairies, I really enjoyed the stark contrast to Northern Ontario. I even asked aloud: “Am I the only person who likes the prairies?” The province of Manitoba still has some geographic features to offer – a few minor rolling hills and tree formations, little lakes here and there, probably man-made for irrigation purposes. I discovered beauty in the symmetry of the great wide open; the perfectly spaced electric and railroad poles that look like religious crosses and the endless fields of yellow and green topped with blue skies. The prairies remind me of a Van Gogh painting rather than what I originally pictured as a Nevada highway. Still, I was amazed by what Manitobans refer to as “roads”. Anything off of Highway One was essentially a dusty or muddy or grassy mess, and trucks brewed up dust clouds that followed them like a train as we saw them pull off the main road. One wonders if small cars ever survive this terrain. At 5 p.m. I looked around at the emptiness around me, the lack of cars, amenities, anything, and thought of rush hour traffic in the GTA. We went a steady 120 km/h the entire distance between Winnipeg and Regina (save a bit of roadwork), and the two lanes were a huge relief from the one lane of Highways 69 and 17 in Ontario. About 100 km out of Regina I get it. The prairies are long and flat. They last for what seems like forever or maybe they represent what limbo feels like. I acquiesce to all those people who warned me about them. However, one of the good things about driving west is that you gain a few hours in your travels. We set the clocks back one more hour before hitting Regina, so we arrived there with plenty of time to settle in and go out for a pleasant dinner at The Roof Top Bar and Grill downtown (http://therooftop.ca/). We ate outside surrounded by dark wood features and silvery aluminum table tops; there were two fire pits in each corner of the patio, and the trendy folk of Regina sprawled around them gossiping into the night. The service was attentive and friendly, and the meal affordable. Two salads, two meals (including a 14 oz. prime rib! ), a bottle of Lindeman’s Cabernet Sauvignon and a three cheesecake sampler for dessert was under $100. What a nice change from big city dining! Our sleeping accommodation was the Holiday Inn Express, which was conveniently located downtown close to the bars and restaurants. The room was well-sized, and had a spacious bathroom. We were told we had to pay for parking and I was surprised to hear it was $6. Again, it is always great to find that things are cheaper than you expect. I would highly recommend both the restaurant and the hotel if you choose to stop in Regina on your cross country travels. Day Four entails more prairie-driving through Saskatchewan and Alberta, and then finally, the arrival into mountainous B.C. Stay tuned for more news! Today was an easy go as compared to Day 2. We woke up early due to the time change to a mist-covered Lake of the Woods, and watched fishing boats and floatplanes motor off into the distance. The Best Western was comfortable and had a good view, but unless you like to hunt or fish, Kenora doesn’t really seem worth the stop. We were excited to see that the Safeway grocery store also included a Starbuck’s, and paid $6 for a coffee and a latte (thank goodness for a gift card!) and were on the road before 8 a.m. The drive around the lake was picturesque, and we even saw a mama and baby deer on the side of the road before getting to the Manitoba border, which came more quickly than expected. A pit stop to the tourism office was helpful: we picked up a map of Winnipeg and got some information about a short hike near West Hawk Lake, an appealing camping area just off Highway One. Approximately 4 km from the tourism office, we got off on Highway 44 and parked at the Nite Hawk Café, a place known for its delicious home-cooked food. We walked through a wooded area from the trailhead in the café parking lot, an area that serves cross country skiing in the winter. A few hours later we arrived at The Forks historic/tourist area in Winnipeg , which was charming and full of local colour and culture. There is a nice walk along the Assiniboine River, and The Forks Market area has a lot to offer in terms of food, both fresh and prepared, in addition to clothing and other shops. The architecture and layout is reminiscent of other markets around the globe, including Covent Garden in London and Granville Island in Vancouver. In need of a place to charge my camera battery, we were drawn in to The Baja Beach Club, where our waiter kindly served us mojitos, recharging our spirits along with my camera. 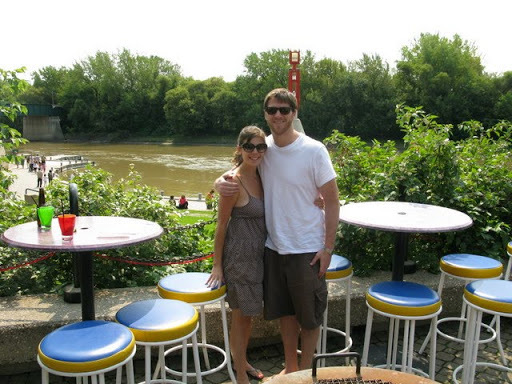 We had a nice view of the river and could see both the pedestrian and rail bridges on either side of the outdoor patio. It seemed like a great spot to grab a cold beer on a hot summer afternoon or night. Overall, I think Winnipeg would be worth the visit for a few nights in the summertime. The people are friendly, the atmosphere light and fun, and there is a lot of history to be found. The cross country drive is a huge undertaking, and not one to be taken lightly. Unfortunately, when you are moving across in addition to doing the drive, you don’t necessarily find the time to do all the research! The trip has been great so far, albeit much longer than expected. Today we covered approximately 1200 km, our biggest day, and a hard one to fathom when you are on Google Maps; it is a much different experience in person! The first part of our journey from Sault Ste. Marie was along Lake Superior – a breathtaking and magnificent drive. We all know that the Great Lakes are just that: great or large or grand, but until you physically make your way around one of them, it’s hard to understand their vastness. I also enjoyed all of the little lakes along Highway 17. All clearly labelled: Rouse, Black Fox, Red Rock, and my favourite group of lakes, Mom, Dad and Baby just outside of Wawa! And the mountainous vistas and turquoise water near Rossport (between Marathon and Thunder Bay) made it difficult to keep my attention to writing. This area reminded me of the islands, mountains and ocean views near Horseshoe Bay in B.C. Overall, I highly recommend the drive across Ontario to Thunder Bay, as it is one of the most rewarding travel experiences I have had. Although we got a few hours of downpour before Wawa, we were blessed with mostly blue skies and only intermittent clouds. My goal of getting photographed with things “larger than life” did get rained out, but I managed a quick photo of the Canada Goose at the Wawa Tourism Office before skipping over puddles to get back to the car. As this was our longest travel day, we wanted to make up some time by driving a little over the speed limit. Unfortunately, the OPP are everywhere on the Trans-Canada and we got pulled over. The speed limit is 90 km/hr and we were doing 120 km. Perhaps because of our charming apology, or perhaps because we were moving to another jurisdiction in the country, we got off with a warning and a reminder about the dangers of moose along the route. Apparently they have bad vision and can’t distinguish cars. 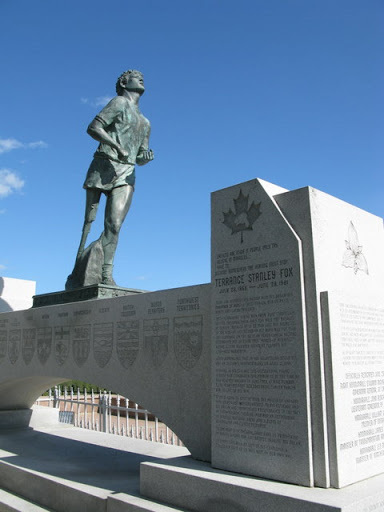 Just before Thunder Bay we stopped at the Terry Fox Monument. I think it is important to take advantage of moments where you can just stop and reflect about the heroes who have shaped our country’s history. We all know him as an inspiring figure for his courage and perseverance, but he also represents all of the qualities we hope to have as Canadians. The province has done a great job with the monument, set high upon a hill with a panoramic view of Lake Superior, and it is worth the stop. We took a longer break in Thunder Bay to have an early dinner. There wasn’t much in the way of selection for a casual place with decent food, but we were lucky and found a restaurant called Gargoyles which had a good atmosphere and decent salads. After a day of sitting in the car, we were looking for something a little healthier, and were pleased with our choice. It was affordable and hit the spot. The last part of the drive from Thunder Bay to Kenora was a struggle, as we had been in the car for so many hours already and just wanted to settle down for the night. Still, just when you think you’ve become immune to the beauty of the natural landscape, Canada hits you with an unreal sunset that captures both your attention and your spirit. We arrived in Kenora, Ontario at 11:30 p.m. (10:30 with the time change) to the Best Western Lakeview Inn on The Lake of the Woods. We crumpled into separate beds and took some time to wind down after an epic day. 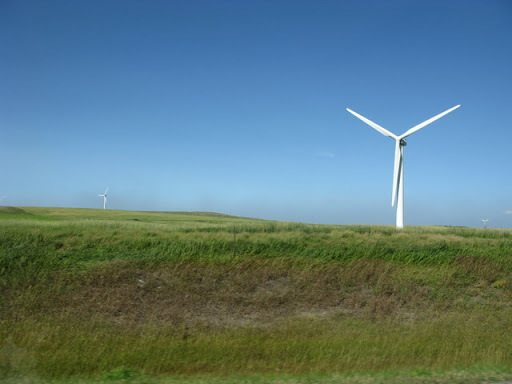 Stay tuned for Day Three of the journey – through the Prairies! We set off Tuesday morning from Toronto, about an hour later than planned, as leaving the house in a respectable state took longer than expected. My fiancé and I are taking on the cross Canada trip as we move our lives to Vancouver, B.C. Luckily, we have someone else doing the driving for most of the big stuff, like furniture and boxes upon boxes of books, but the Mazda 3 needed to make the journey too, and us with it. 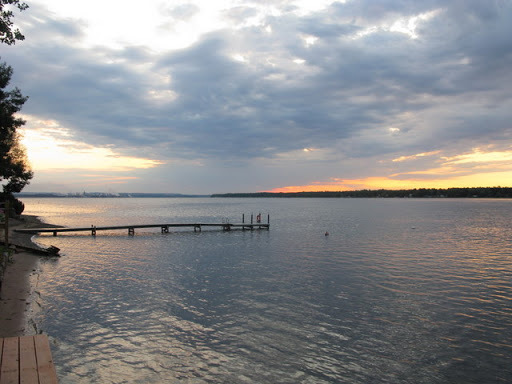 Our first day was relatively smooth – arriving in Sault Ste. Marie after approximately eight and a half hours of driving. The new four lane highway leading into Sudbury was a pleasant surprise, and we chuckled at the ineptitude of the GPS to track our progress (it turns out they really do need updating every few months). We dined on Tim Horton’s for both breakfast and dinner, a fact that shouldn’t be a shock to most Canadians, but for some reason we believed that at some point we might be able to get a nicely brewed coffee from somewhere like Starbuck’s. No such deal. The Sault (Soo) proved to impress more than expected. Although truly “in the middle of nowhere” for those of us from Toronto who are used to driving only 2-3 hours to get to northern cottage destinations, it’s natural beauty is very appealing and worth the trek into the wilderness. It is enveloped by a variety of deciduous trees and has a sunset to die for. According to our guide (a good friend who is from the Soo), Gros Cap is the best place for sunset vistas, but it is now closed to the public. We ventured out to Hiawatha Falls, a 25-minute drive from the airport, and enjoyed rolling waters cascading down the zigzagging rocks there. A mini-hike in flip flops brought us to the top of the falls, where you gander at your own risk, as there is no protective barrier between you and the rocky waters. Next, we took a short stroll along the St. Mary’s boardwalk that snakes around the river, and watched the sun go down beyond the patchwork bridges on the American side of the water. We finished our evening along the water on Pine Shore Drive, and watched the high, bright half moon framed by windswept pine trees, as the stars peeked out one at a time and freighters billowed by. The fog horns, pre-empted by a low rumble in our cabin, woke us up briefly in the night, but their mysterious and fascinating interruption was welcome. I haven’t slept that well in weeks. And it was a good thing because Day Two proved to be a marathon of a drive…stay tuned for the next instalment!